Robert Stephens, Robert Powell. Jane Lapotaire, Alex Scott, Ralph Arliss. 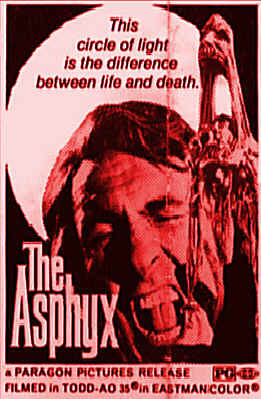 The Asphyx or "Spirit of the Dead" (at least as it mythically manifests itself at the moment of death) is the title and subject of this enjoyable, if sometimes laboured, elegant science- fiction. Set in Victorian England, decor and manners, with the dawning of scientific inventions, experimentation, as well as psychic research, the film shows how the longing for immortality and to play God with one's own life was possible for a rich Victorian dabbler in science. The film also moralises and audiences should welcome mortality after seeing it. Robert Stephens and Robert Powell bring style to a beautifully mounted and photographed film which is also strong in special effects and tormented screaming asphyxes. 1. Which is the better title, 'The Asphyx' or 'Spirit of the Dead,? Why? 2. How important was the style for this film: the colour, Panavision, Victorian atmosphere, locations, sets? 3. Why do audiences like science-fiction films? Science and progress, the free flight of fantasy and imagination, fears? How did this film illustrate these ideas on science-fiction? 4. Was the plot credible? The ideas and the characters? Were they presented credibly? How authentic was the background? How convincing the details? Did this give the film plausibility? 5. How important was the modern setting at the beginning and end? An alert to the themes of the film? Our knowing that the end would mean no death for Sir Hugo? How did this modify the mood of the film? 6. What did the film have to say about death and its necessity? The pros and cons of immortality for human beings? Man's longing for immortality? His fears? The pros and cons of his playing God? (Note, however, the Victorian reverence also for God's will). How well were these themes portrayed? 7. How much did the Victorian atmosphere help the film: the family reunion, the emotions and Victorian language, the home and its elegance, the lake and the boating, the scientific meetings, the scientific equipment, the hanging etc.? Did this make the plot more convincing than with a 20th Century atmosphere? 8. How successful was the central role of Sir Hugo? A typical 19th century gentleman, his children, fiancee? His interest in science, photos? The growing obsession? Photographing his son and the hanging? Immortality and playing God? Loving yet using his family? The sorrow and the remorse? His decision to stay immortal and atone? The horror of the ending? 9. How did Giles contrast with him? A potential Sir Hugo? His place in the family, his love, his horror, his sacrificing himself yet vengeful on Sir Hugo? 10. The Asphyx itself? How credible was this, the explanation of the Greek myth of the torment and the release, the photos and the smudges, Sir Hugo's seeking the Asphyx, the impact of the deaths, the hanging and the lighting to discover the Asphyx, the experiments for capturing it, the visual portrayal of the Asphyx and its screaming? How exciting was this? 11. The details of the experiments and audience involvements in these: the guinea pig, the porker, Sir Hugo and his electrocuting himself and the capture of the Asphyx? 12. The contrast with the horror of Christina's death? The horror of Giles' death? 13. What impact did the explosion have? Sir Hugo's decision to burn the combination lock key? 14. Why was the ending horrible? The prospects for Sir Hugh? The moral for immortality? 15. How interestingly did the film explore the themes of life, death, ambition, nature, science?